The Catalogue gives details of over 780 palm-leaf manuscripts and 5 parabaiks that will be made available as PDFs on a website being prepared by the staff of the Robarts Library, University of Toronto, Canada. 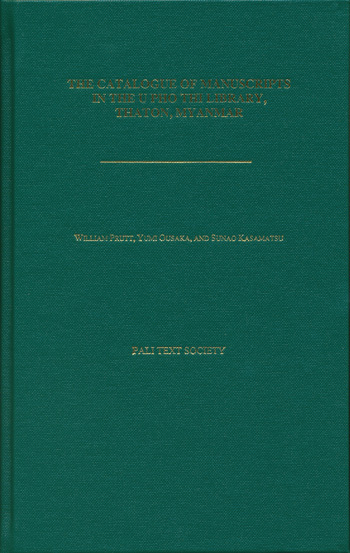 In the meantime, scholars can request PDFs of individual texts by contacting the Pali Text Society. The texts cover a wide range of Pāli canonical texts, commentaries, and sub-commentaries. There are also many rare texts in Burmese, Burmese nissayas, and Mon nissayas. The project to photograph the manuscripts was sponsored by the Pali Text Society and financed by several generous grants from Japan. Note: there is no Pali or Romanized Pali in this text. It is in Burmese, Mon and English.